22nd September 1917, German East Africa. After a successful 18-month long campaign in the German Cameroons in West Africa the Nigeria Regiment was selected for operational duty in German East Africa (GEA) and the soldiers were asked to volunteer for this overseas service. Four battalions were formed, each of four companies with each company having 104 men. The companies were numbered from 1 to 16 and the battalions from 1 to 4. A brigade headquarters was formed under Brigadier-General F.H.G. Cunliffe CB CMG. A battery of four 2.95-inch quick firing, breech loading mountain guns was an integral part of the brigade. In total the Brigade consisted of 2,402 Nigerian rank and file, 125 British officers, 70 British non-commissioned officers (NCOs) and 812 machine gun and battery gun carriers. New Short Lee Enfield rifles were issued on embarkation and the men learned how to use these during the two weeks of sailing round southern Africa. The Nigerian Brigade disembarked at Dar Es Salaam, GEA, on the 12th and 13th of December 1916. 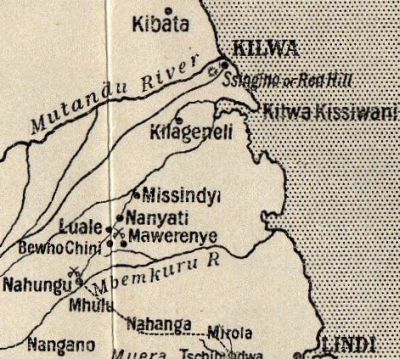 During early 1917 the Nigerians fought in the actions around the Mgeta and Rufiji Rivers and then, as the outstanding German commander General Paul von Lettow-Vorbeck was squeezed into south eastern GEA, the Nigerian Brigade less the 3rd Battalion was moved to Kilwa, arriving there by sea in late August. By now the Brigade had been reinforced by drafts of infantrymen from Nigeria, Nigerian Pioneer and Signals Sections, more carriers from Nigeria and Sierra Leone, a rifle company from Gambia, plus the West African Field Ambulance and the 300th Field Ambulance. The Brigade was issued with Lewis Guns (light machine guns), Stokes Mortars and hand grenades, and specialists in these weapons were trained. After a week of training in the open countryside around Kilwa the Brigade marched off to the front – a march that was to last three months because of the fluid nature of battle in the East African bush. The German Schutztruppe, in contact with British columns to the north, was withdrawing southwards and the British command hoped that the Nigerians could block the enemy route. On 22nd September the 1st and 2nd battalions of the Nigeria Regiment reached a hamlet named Bweho-Chini and after driving off an enemy picquet started digging-in. Bweho-Chini was an important track junction, and different routes through the thick bush converged there. 2nd Nigeria Regiment was commanded by Brevet-Major and Temporary Lieutenant-Colonel G.L. Uniacke. Gerald Lawrence Uniacke, Royal Lancaster Regiment, (Special Reserve, Reserve of Officers), was no stranger to fighting in Africa. He had served in the South Africa War earning the Queen’s Medal with five clasps, in the 1903 Kano-Sotoko Campaign in northern Nigeria, in three minor operations also in northern Nigeria between 1907 and 1908, and in the Cameroons campaign where he was Mentioned in Despatches (31 May 1916). He had retired as a soldier and taken up government service in Nigeria but he returned to the colours on the outbreak of war. 1st Nigeria Regiment (1NR) dug in around the north of the village and 2nd Nigeria Regiment (2NR) around the south (the initial 2NR company positions are marked as Nos 5 to 8 Co. on the sketch map). 2NR had an extended front and could not cover all the ground on the south side. The men of both battalions ate breakfast and were then ordered to form up to move out to attack an enemy position nearby, and they waited until noon ready to move. A baggage party was sent out on the southern Bweho-Carti road to dump the two battalions’ baggage with 4NR prior to the attack (it appears that all the 2.95-inch mountain guns were located with 4NR and so were not in action at Bweho-Chini). This baggage party soon returned to Bweho-Chini accompanied by one German white and three enemy Askari prisoners along with 40 loads of ammunition that these four men had been escorting when the NR baggage party bumped into them. (See the citation for a Military Medal to Sergeant Mafinde Shewa, 2NR, later in this article.) Six of these ammunition loads were .303 (the British rifle calibre) and the Nigerians were to make good use of them before the day was over. A Nigerian picquet on the Bweho Ju track to the south brought in another German white prisoner, and scrutiny of the documents he was carrying showed that Bweho-Chini was on the main enemy withdrawal route. The Brigade Commander, who was now at Bweho-Chini with his headquarters, cancelled his attack plan and ordered 1NR and 2NR to return to their defensive positions and improve them. But time had been lost in waiting for an attack that never happened and most trenches were only dug deep enough to conceal a man in the prone firing position. Around 1230 hours two companies of 1NR were ordered to patrol eastwards on the Mawerenye track to reconnoitre the Schutztruppe units now believed to be assembling there. Soon after the departure of these two companies a British aeroplane flew over Brigade Headquarters and dropped a message. At the same time the two companies came under heavy fire from an enemy party that was advancing westwards towards them. The Germans were heading towards Bweho-Chini with over 1,000 men, 100 of them being European, and over 20 machine guns (Schutztruppe machine gunners were white, Askari being used as the supporting crews). The German commander was Captain Koehl and his force consisted of four Field Companies of Askari (Nos 10,14,17 & 21) and four smaller sub-units mainly composed of Europeans (Nos 3 & 6 Schutzenkompagnien and Geschutzen Batzner & Haberkorn). Koehl ordered an envelopment of the two Nigerian companies facing him, thinking that these companies were the only British troops in the area. The Nigerians fixed bayonets and repulsed the initial German assaults but were quickly outnumbered as more German Askari appeared on the British flanks. The two companies fought a desperate retirement back into the perimeter. Because the Brigade Commander was present, and using a rifle himself, he was able to personally endorse many citations for gallant actions, and battle scenes can be followed through citations that led to awards. L/Cpl Mallam Duchi, 1NR: Displayed great gallantry at Bweho-Chini on 22nd September 1917 in using his machine gun, which he continued to use under very heavy fire until it was put out of action and he himself was wounded. He then brought back his gun by himself and so saved it from being captured. Private Momo Sokota, 1NR: Displayed great gallantry at Bweho-Chini on 22nd September 1917 when in charge of stretcher bearers. He was specially mentioned by the Senior Medical Officer for the way he conducted stretchers up to the firing line across a fire-swept area and dressed his wounded comrades under heavy fire. Lieutenant H.S.V. Raby, 1NR: At Bweho Chini on 22nd September 1917 his conduct was most fearless under very heavy fire and his control over his section was most marked. When out in the open he showed utter disregard of the enemy fire and kept his men steady by his personal example. When back in the trench he repeatedly left his cover in order to put either a Lewis or machine gun in order. Lieutenant J.J. Hart, 1NR: Most gallant conduct under most heavy fire at Bweho-Chini on 22nd September 1917, when he bandaged a shattered leg of a brother officer and later carried him back to cover, thereby narrowly escaping capture himself. Afterwards he greatly helped to steady and rally his section by his fine example under a very heavy cross fire. Sergeant J.H. Watkins, 1NR: Showed at all times marked ability in leading his Company scouts. At Bweho-Chini on the 22nd September 191, when in charge of the scouts, he held the enemy’s screen for three hours, enabling his Company to engage the enemy on their whole front and break up their attack when they attempted to deliver a charge. Captain Koehl now ordered troops to move round the north of Bweho-Chini and attack all sections of the Nigerian position, and Gerald Uniacke’s 2NR came under very heavy pressure as German machine guns came up to within 60 yards of the perimeter. No 8 Company came under attack first and because there were no adjacent troops on its left flank Gerald Uniacke ordered No 5 Company, his reserve, to move half the company to the position marked “C” and send the other half with one machine gun and one Lewis Gun to the position marked “B”. Lieutenant G. Studley was in command of the second half, and in true army fashion, having just dug-in at position “B” he was then ordered by Brigade Headquarters to move nearer to position “D”. (The West African Frontier Force Regimental History comments on the poor planning by Brigade Headquarters both in not having trenches dug properly and in allowing doubt to exist about who actually controlled 2NRs’ reserve company.) Studley was in the thick of the fighting for the remainder of the action. As the afternoon wore on Koehl’s men, with company buglers sounding the rally and the charge, furiously probed for a weak spot in the Nigerian perimeter that could be penetrated. At around 1530 hours Sergeant Mafindi Shewa, 2NR, saw an enemy group under two Europeans examining his perimeter. The citation for his Military Medal reads: Displayed the greatest gallantry at Bweho-Chini on 22nd September 1917 when in command of 16 men he rushed an enemy post and captured a European and 29 boxes of ammunition. Again, later in the day, when his company was heavily attacked and in danger of having a flank turned, he charged and drove them back with his section. He, by himself, chased a German officer through the bush for 300 yards and bayoneted him, notwithstanding the fact that the enemy were all round in strength. He then killed a German Askari after he had been seriously wounded himself. Thirty minutes later a serious German attack came in from the south and Lieutenant G. Studley and his men were moved yet again to position “D”, near a prominent big white tree, and ordered to take up firing positions in the open. Conspicuous gallantry in the action at Bweho-Chini on the 22nd September 1917. He defended 30 yards of front in a most exposed position with a Lewis Gun, and in this way stopped two most determined attacks. Koehl, having now discovered the true strength of the Nigerian position, temporarily halted his attacks but maintained heavy fire from the south against the areas of the big white tree and the big Ku Ka tree. Using the prominent trees as aiming marks and then moving their rifle barrels a distance right or left, as ordered by their NCOs, the German Askari swept these two locations with effective fire. No 5 Company near the white tree took 33 casualties and No 6 Company near the Ku Ka tree took 18 casualties in a 30-minute period. The Field Dressing Station north of the Ku Ka tree had been hit by enemy fire, and as dusk fell the Nigerians improved the cover around it. 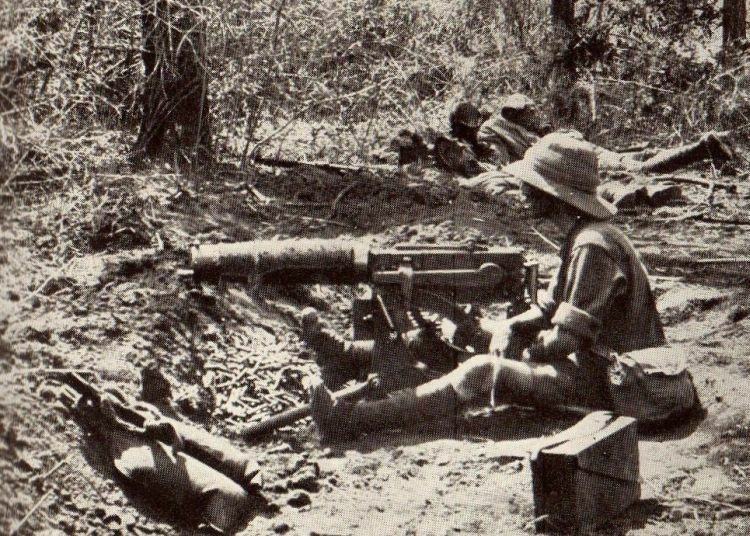 Whilst the West African carriers had remained on duty carrying ammunition replenishments to the rifle platoons, the locally hired carriers had vanished into the bush, preferring to risk being shot by the Germans rather than to stay inside the perimeter and carry ammunition and casualties under fire. Lieutenant R. Steed, 2NR: At Bweho-Chini on 22nd September 1917 he rendered most valuable service by his skill in using a machine gun, which he continued to serve long after he had been wounded himself. Captain M.E. Fell, 2NR: Again at Bweho-Chini on 22nd September 1917 showed the greatest gallantry by his total disregard for personal danger under very heavy fire. In this action he kept his men absolutely steady by his example of coolness under fire. Captain A. Gardner (Bar to MC), 2NR: Displayed the greatest gallantry at Bweho-Chini on the 22nd September 1917. This officer with Captain Fowle MC held the left flank during repeated and most determined attacks. His company charged the enemy during the most critical time, and inflicted heavy loss on them with the bayonet. Captain C.H. Fowle (Bar to MC), 2NR: Has at all time displayed marked coolness and gallantry in action, and has been a most reliable officer throughout the campaign. At Bweho-Chini on 22nd September 1917, he commanded his company with the greatest ability, helping to repulse several most determined attacks. Owing to his fine personal leadership his men have the greatest confidence in him. Five British NCOs from 2NR and one British sapper signaler from Brigade HQ received Distinguished Conduct Medals for gallantry displayed at Bweho-Chini. The NCOs awards were for effective use of Lewis and machine guns when under very heavy enemy fire. By midnight Koehl’s men had paused to collect their wounded and bury their dead, and by dawn they had withdrawn south to Nahungu. The Nigerians were down to 25 rounds per rifleman. Afterwards 16 enemy European bodies and 87 enemy Askari bodies were found on the battlefield. Later intelligence reports indicated that the total German casualties were 40 Europeans and over 300 Askari killed, wounded or taken prisoner. The Nigerians had held their ground and had won the day, but at a price. Ten Europeans and 124 Nigerians had been killed wounded or were missing. Four of the dead were British officers, two of whom had been in the two companies of 1NR that moved eastwards out of the perimeter. They had been wounded, overrun by the enemy and stripped, mutilated and killed. That can be the way that things go in Africa. From now onwards the Nigerians dug trenches that they could at least kneel in, with a high parados behind them to stop reverse fire. The battle of Bweho-Chini is rarely mentioned in history books – two determined groups of men met in the African bush and the grass was trampled and stained with blood for a time, but the sun and the rain soon restored the natural order of things. Gerald Uniacke, Commanding Officer of 2nd Nigeria Regiment, had with his battalion fought the enemy to a standstill and he was awarded a Distinguished Service Order with the citation: Conspicuous gallantry at Bweho-Chini on 22nd September 1917 when in command of his Battalion. He had already been nominated for a DSO with a citation reading: Continuous good work throughout the campaign and skilful leadership since being promoted to the command of a Battalion. Gerald ended the war still in command of 2NR and with a DSO and Bar. He then returned to government service in Nigeria. With The Nigerians In German East Africa by W.D. Downes. My Reminiscences of East Africa by Paul von Lettow-Vorbeck. The History of The Royal West African Frontier Force by Haywood & Clarke. The Forgotten Front by Ross Anderson. General van Deventer’s Despatch dated 21st January 1918. War Services 1922.